Hiya guys! I have such an overdue and long awaited post to share. Today I'm sharing a lengthy review on a new product from the brand Mitty called Flawless Finish. A new alternative to using liquid latex, Flawless Finish are easy peel-off mani tapes. These are 100% cruelty free, vegan, biodegradable, and recyclable. For the last few weeks I have been testing these and creating different manicures, so expect to see more of them in tutorials after this post. Now let's go ahead and get started. 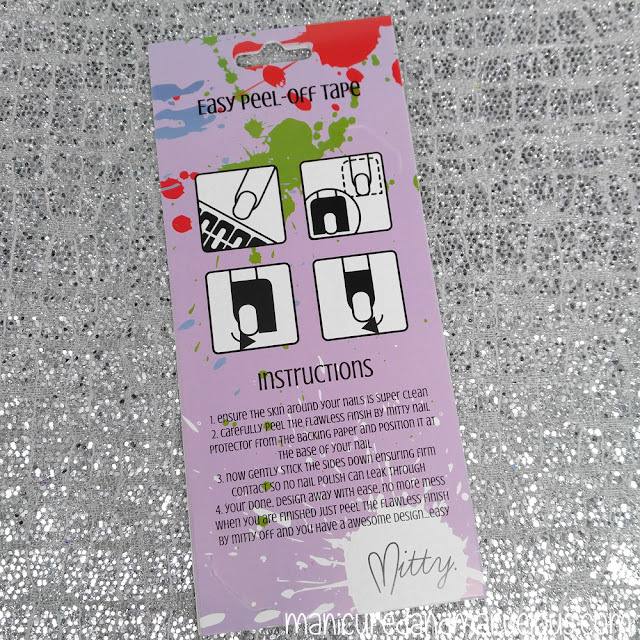 Flawless Finish Peel-Off Mani Tapes from Mitty can be purchased online only. These retail for $9.95 AUD (the USD conversion is approximately. $7.65) per 3-pack and are available in an assortment of colors. All products from the shop ship worldwide for free! If you watched my video before coming here then you may be wondering about the health benefits. Well one major pro for using Flawless Finish as opposed to liquid latex is the ammonia. Although not all liquid latex contains ammonia, most of them do to some degree. Mitty's website explains, "When ammonia makes contact with the skin it reacts with water and produces ammonium hydroxide. This chemical is very corrosive and damages cells in the body on contact. (Source: www.health.ny.gov)"
Each pack comes with a few simple instructions on the back about placement with an illustration. Inside there are 10 easy peel-off high grade vinyl stickers. These are sold in packs of 3 so with each order you'd receive 30 stickers. For my video portion of the review I decided to do a first impression test gradient. Spoiler alert, my first time using these wasn't ace so i decided to give it another go after a few days of practice and show my results for that as well. No dry time. You simply apply and are ready to mani it up. No stickiness. You can apply the mani tapes around every nail without fear of them pulling off each other. Peels off easily and (most of the time) in one peel. These aren't reusable. The website does describe these as reusable, but in my experience I couldn't use each piece of tape more than once. The price. Although the price isn't very high (approximately. $7.65 per three packs) , you'd only have enough for three-four manis. If you're like me and change your nails daily then the cost can end up adding up quickly. Learning curve. As you saw in my video, these may or may not be that easy for you to use (at least at first). It does take a little bit of practice to get the hang of placement. 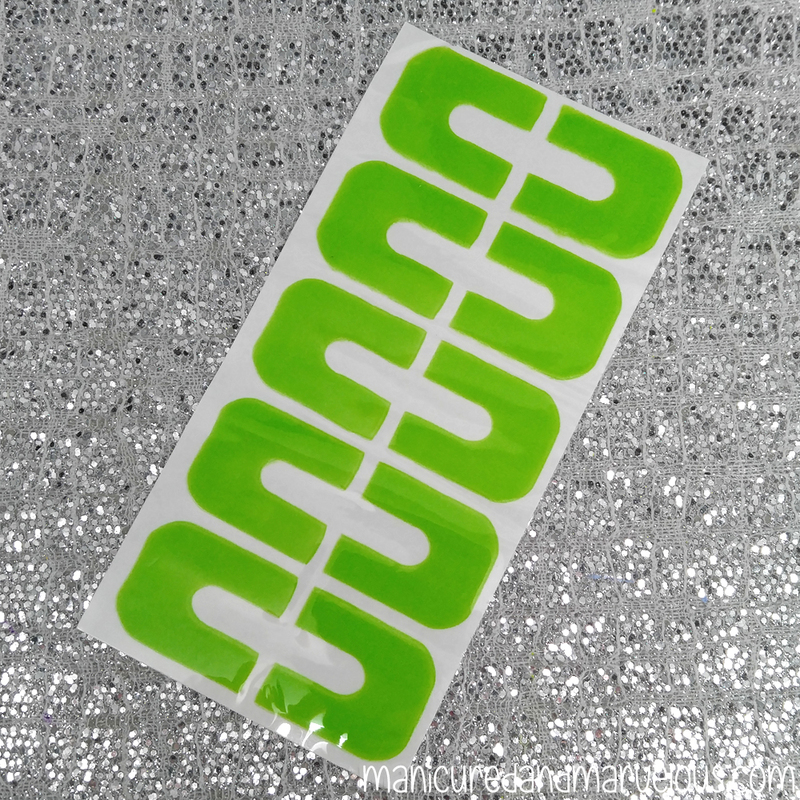 Overall I really like the idea of these mani-tapes and how effective they are for manicures. I do wish these were reusable, I tried a few times but up till now I have been unsuccessful in getting them to work twice. If they actually ever became reusable then I could definitely see myself wanting to use these over liquid latex. As a nail artist, the fact that these don't stick together and have no dry time has me sold. But because I am a serial nail changer, I wouldn't be able to use these long term without the cost weighing on me. That said, what do you guys think about these peel off mani tapes? Would you consider purchasing Flawless Finish? To recap, Flawless Finish Peel-Off Mani Tapes from Mitty can be purchased online only. These retail for $9.95 AUD (the USD conversion is approximately. $7.65) per 3-pack and are available in an assortment of colors. All products from the shop ship worldwide for free! I love that there's no dry time with these and that they wont stick together. Id have issues with getting them close enough on my nails without covering the nail up though. Even though I use cuticle creme all the time I tend to have a hard time cleaning polish off of my cuticles and along my sidewalls because they are dry. Sadly the only peel off products that seem to work for that as far as application goes are the ones with the striping brush applicator. And those take forever to cover up enough of my finger. So I use them really close around my nail and then switch to a regular brush one for the rest. Id love to find one product that works instead of needing two every time. I really enjoyed your thorough review.